This page describes how to register and configure your application with the Google push notification service. 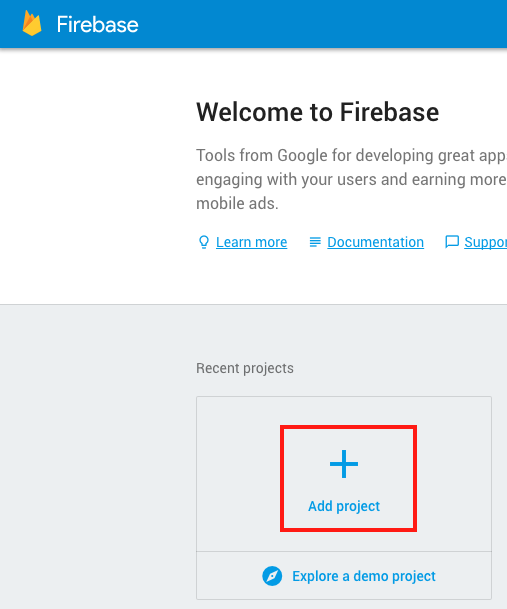 You need to create a new Firebase project in order to obtain the API keys for using FCM. 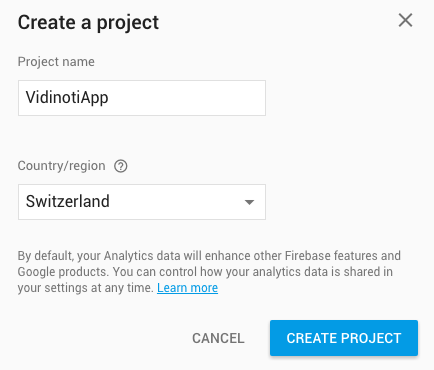 Create a new Firebase project. Go to https://console.firebase.google.com/ and add a new project. Register your Android application. 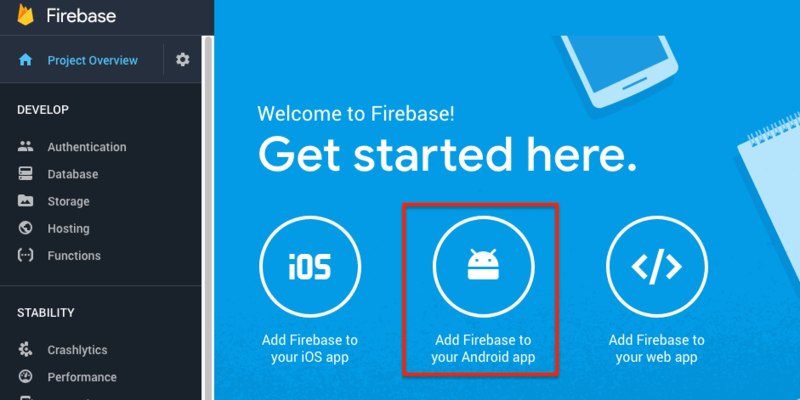 Click “Add Firebase to your Android app”. Enter your application package name and retrieve the file google-services.json. We will need this file later. In your Firebase project page, go to the settings (top left of the page). Open the “CLOUD MESSAGING” tab. And copy the Legacy server key. Go to V-Director under the “My applications” section (V-Director > SDK > My Applications). 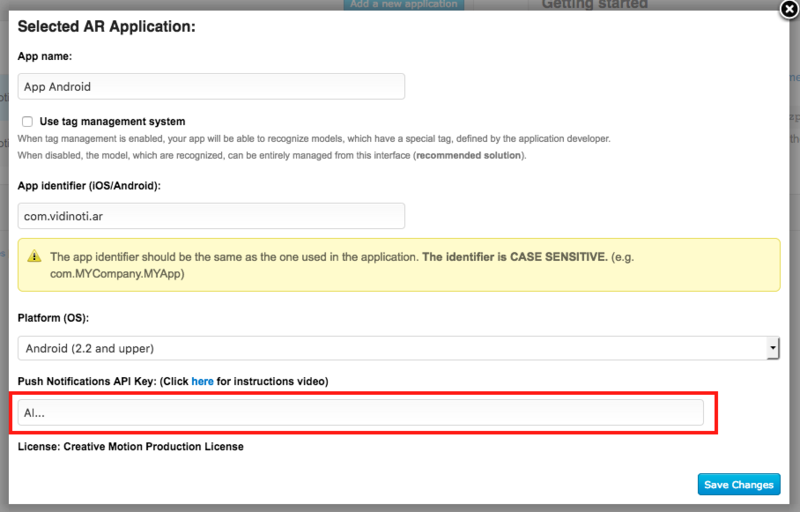 Edit your application and add the legacy server key in the “Push notification API key” field. This section describes the different steps that you must perform on your application code. For a complete example, see the demo application provided with the Vidinoti SDK. Take the file google-services.json that you have created earlier and move it to your Android app module. Edit your build gradle files. Create a new service that will receive the FCM token renewals. The token must then be forwarded to the Vidinoti SDK. * Service required for the push notifications. * It receives the update of the Firebase token that needs to be forwarded to the Vidinoti SDK. Creates a service that receives the push notifications. By default, we create a notification in the status bar. * Service that receives the push notifications. * When a new notification is received, it creates a new notification in the status panel. Add the two above services to your AndroidManifest.xml file. Add the following code in the onCreate method of your launch Activity. It gives the information about the push notification to the Vidinoti SDK. The SDK will then handle the notification appropriately. Call VDARSDKController.getInstance().setNotificationsSupport(true); once the SDK has been initialized. Once you have done all the above steps, you should be able to send push notifications to your application via the V-Director platform.